The Australian Alps are the highest point of the Eastern Highlands, which skirt the eastern margin of our continent and wrap around into western Victoria. At their highest (Mt Kosciuszko), they reach just 2228 metres into the atmosphere in the far southern corner of NSW, while in Victoria they reach up to 1986m at Mt Bogong, Mt Feathertop (1922m) and Mt Hotham (1959m). Within this region is an area of 1.5 million hectares, heavily protected by a string of national parks to shelter an ecology that is unique to Australia and contains hundreds of species of distinctive plants and animals. 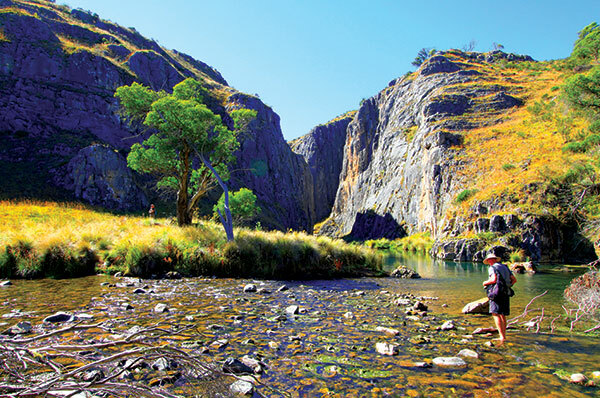 The two major parks are the Kosciuszko National Park in NSW and the Alpine National Park in Victoria, with the whole region being included on the National Heritage List. These relatively low-level peaks are a consequence of erosion; which, having taken place over a long period of time, eventually made way for the much smaller mountain tops that we see today. The early geological history of the region was one of shallow coastal seas, extending eastward from a shoreline around Broken Hill to Mt Isa. This was a time of numerous small tropical volcanic islands pouring out lava, and rich in gold and other minerals for which the region is well known. Around 440 to 360 million years ago, the thick sediments which formed in these seas were buried and compressed, concentrating deposits of minerals such as gold in thick layers of slate and schist. At the same time, huge masses of granite were formed from molten lava underground. However, some places have been very resistant to erosion, such as Kosciuszko Plateau in NSW, Mt Buffalo, Mt Baw Baw and Mt Wills, in Victoria. Others have been easily broken down by erosive forces, producing wide valleys in Cudgewa to Thowgla and Ensay to Swifts Creek, Victoria. Around the margins of many of these islands, coral reefs were formed, which turned to limestone, and subsequently eroded to produce the spectacular cave systems and gorges that can be seen at Yarrangobilly, Blue Waterholes and Buchan. The actual age of the Australian Alps is widely disputed, but the majority view is that it was formed as the result of tectonic action about 100-60 million years ago. At the time, Australia was a component of the supercontinent, Gondwana. But this was starting to fracture into many of the land masses that we know today — South America, Africa, India, Australia, Madagascar, Antarctica and Australia. The separation of these pieces began by an upwelling of molten material, below what became coastal areas, causing the creation of highlands around 2000 metres high, at what was to become Australia’s south east; followed by stretching of the crust which caused blocks of material to drop down into the gaps created, much like the Great Rift Valley in Africa, today. This resulted in highlands with gentle slopes on the inland side and steeper slopes near the newly formed coast, largely completed about 95 million years ago. Erosion created valleys and high points, with some infilling from lava flow. About 50 million years ago, there was a second bout of uplift, as Australia broke away from Antarctica and began its drift northward. In doing so, the eastern margin of the continent passed over a spot of mantle upwelling called the South Pacific Superswell. The Earth’s mantle is a layer of semi-viscous material between the Earth’s outer crust and the inner core. In places it can push upwards, and its denser make-up produces gravity anomalies: A rock dropped on your foot here would make a bigger bruise than one dropped elsewhere, though the difference can be so slight as to not be noticeable. This secondary movement created a new level of mountain building and is evident in a fresh phase of river erosion around the margins of major stream beds. The relatively low level of the mountain peaks in south eastern Australia resulted in only a small amount of glacial activity during the recent Ice Ages (30,000 to 15,000 years ago). This was limited to small valleys above 2000m around Mt Kosciuszko. 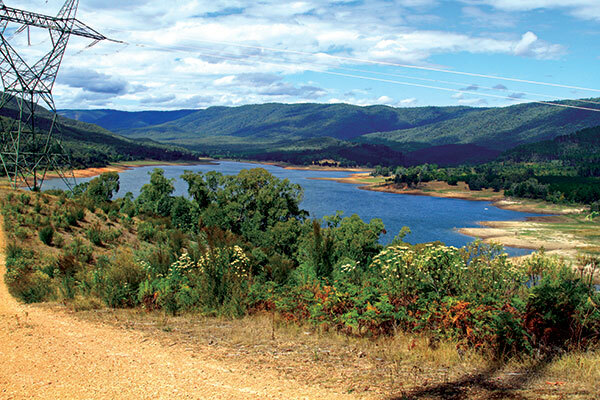 The uplift of the Australian Alps, and indeed the whole Eastern Highlands, changed rivers which had originally run to the sea into our vast inland drainage system, including the Murray-Darling Basin. Rivers continuing to flow to the sea became shorter and more vigorous on the steeper eastern slopes. The Australian Alps are also the source of significant amounts of power for the major cities and towns of the south-east corner of the nation. The Snowy Mountain Scheme, completed largely by immigrant labour in the 1950s, diverts and stores water from both the western and eastern sides of the Kosciuszko region and diverts it through tunnels and pipes to power generation sites and a series of dams, in one of the great engineering projects of the mid-20th century. Most of the water finds its way eventually into the Murray River where it is often later used controversially for irrigation projects, leading to water shortage further downstream. Despite all this talk of low-level mountains and plateaus, the erosional forces often created steep slopes, almost always heavily timbered, and early European settlement produced a unique folklore built around the horsemen and women who settled and farmed this country. Their horsemanship especially, became famous, and The Man from Snowy River is celebrated in the Victorian High Country town of Corryong, where the original protagonist of the tale was supposed to have lived and rode. 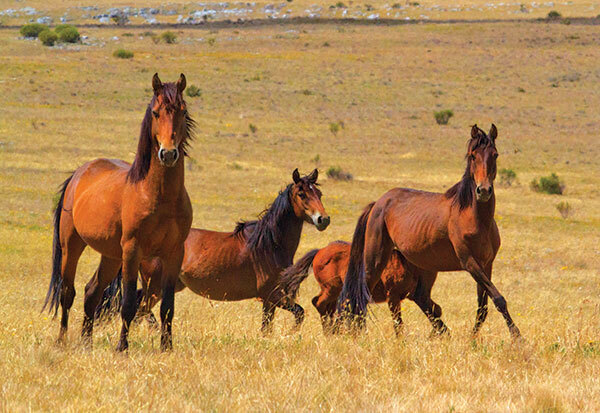 The descendants of those horses still populate high country meadows and are subject to regular culling to maintain their numbers to limits which do not threaten the delicate ecology of the region. The region is dotted with the remnants of high plains grazing activity, including numerous huts and yards, now often maintained by volunteer groups and national parks authorities, as emergency accommodation for fishermen, hikers and 4WD enthusiasts. 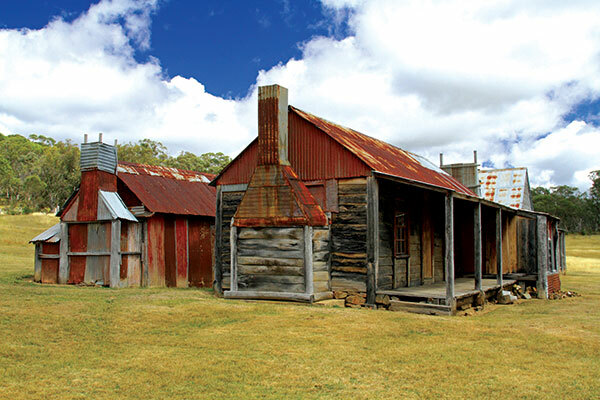 This is a region rich in tourist attractions; from cool temperate wineries to gold mining towns, the engineering marvel that is the Snowy Mountains Scheme to pure Aussie historic associations, such as the many links to the Kelly Gang. Bring your appetite for good pub meals, rich coffee aromas and unique restaurants, or for remote camping environments and isolated cattlemen’s huts on high mountain tops. The Alps are divided into two distinct bioregions: The Snowy Mountains, in southern NSW and the High Country, in Victoria. These biotas contain alpine meadows, snow gum forests, tall eucalypt, tree fern forests and peat moss bogs. Global warming has raised average temperatures in the Alps by 0.4 degrees Celsius since 1979, and rainfall has declined by 6 per cent. This sort of change can have severe impacts on small, isolated alpine environments which have nowhere else to migrate to. Animal life is similar to the forested areas at lower altitudes, with the addition of some cold-adapted species such as the Mountain Pygmy-possum and the Bogong Moth; the latter being a major contributor to aboriginal diets in pre-European settlement times. The region is extremely fire prone, most especially in Victoria, with significant fires destroying many properties and laying waste to vast areas of forest; most recently in 2006-07 when 173 lives and over 2,500 building structures were lost.